WE DO NOT SHIP WOOD INTERNATIONALLY. All wood is shipped by USPS, by weight and zone, and is calculated in the shopping cart. If you want to see what the shipping cost will be, simply add a product to the cart and add your zip code. You cannot order more than what we have in stock. Very nice elm slices. Slightly oval. Measuring 4-1/2" to 5-1/2" diameter, cut at 3/4" to 7/8" thick. Treated. Perfect bark. Some bandsaw blade marks. $1.99 each. 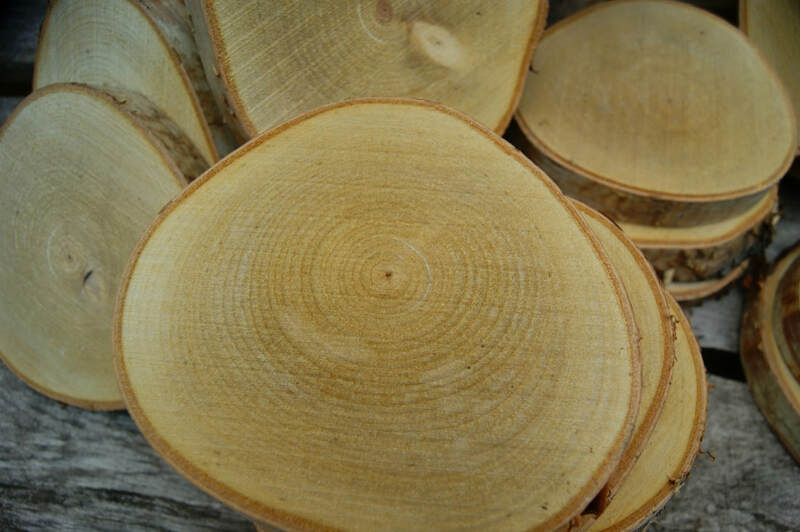 Beautiful Birch Slices - 5" x .75"
Clear birch slices a little over 5" across depending on where you measure them, and cut at 3/4" thick. These have been treated but not sanded but fairly smooth. Bark is in great shape. Cute pear shape. $2.99 each. Slightly Spalted Basswood - 5.5 - 6.25" x 1"
Slightly spalted basswood slices that are between 5-1/2" and 6-1/4" diameter and cut 1" thick. Not treated or sanded. Old stock. Bark is in good shape. Slightly Spalted Basswood - 5 - 5.5" x 1"
Slightly spalted, mostly round (except for a few crotch cuts) measuring between 5 and 5.5" diameter, and cut at 1" thick. Not treated or sanded. These basswood slices have been cut at the perfect time if you love spalt like I do. 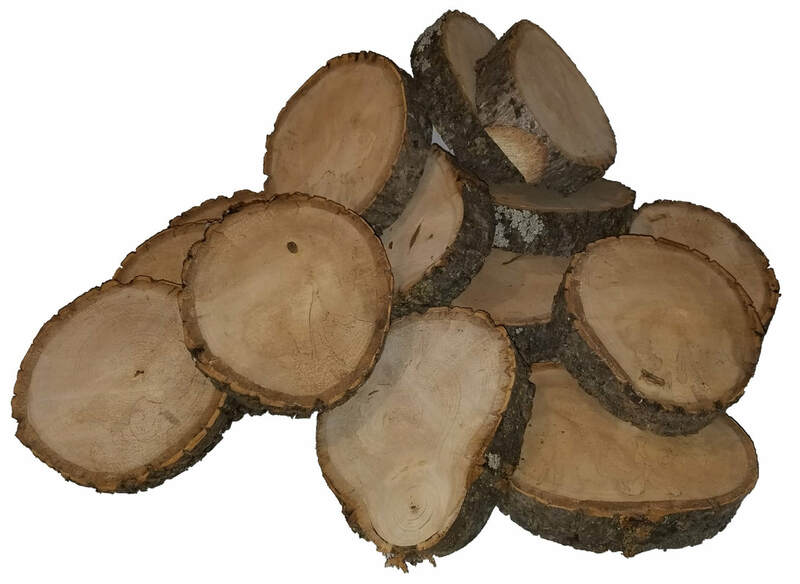 Cut at 6.25 - 6.5" in diameter, and 3/4" thick. 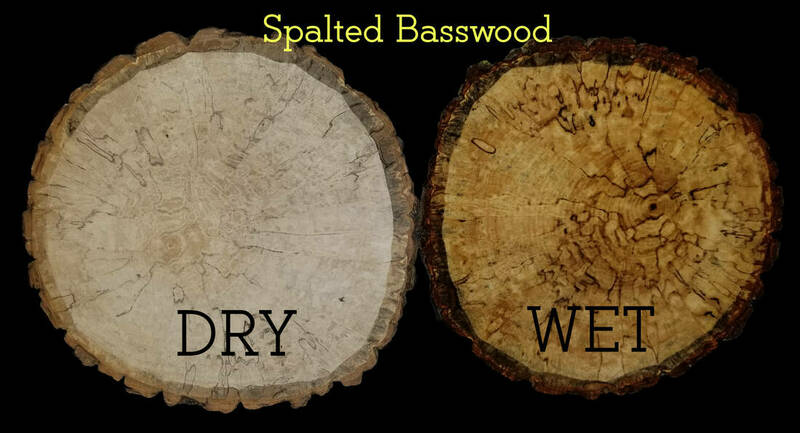 These would make fantastic wall art if you care to give them a coat of mineral oil or varnish to highlight the beautiful spalt marks. Bark is in tact. Sanded smooth on both sides to bring out the beauty of the wood. 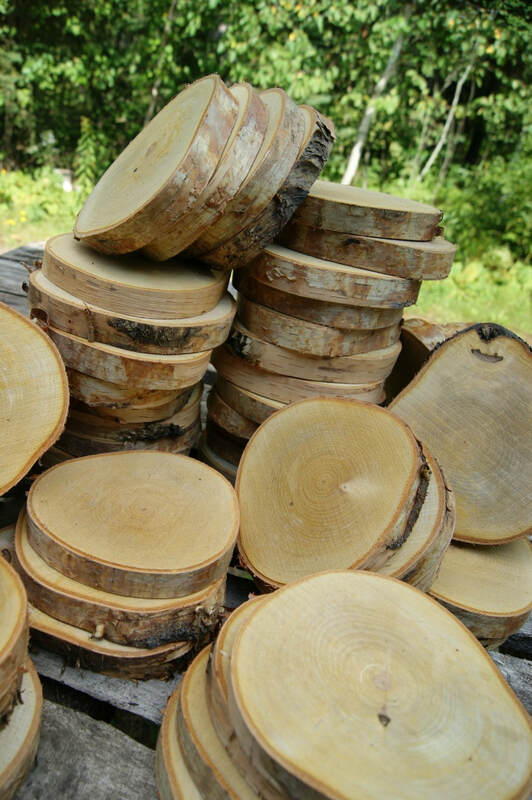 These slices are only slightly spalted, and are slightly oval in shape with some crotch cuts. 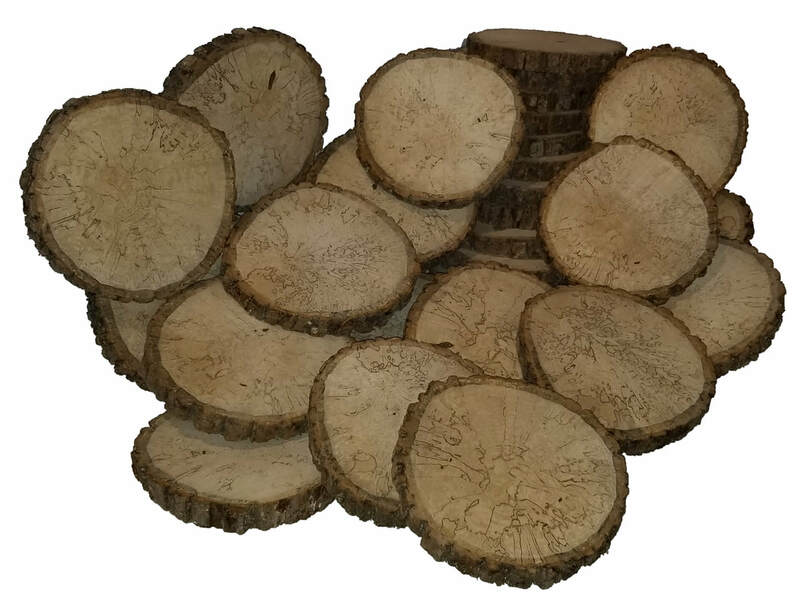 These are 6 - 6.5" diameter and cut 3/4" thick. These are not as spalted as #925. Never treated. Fully dry. Sanded on both sides. These slices are mostly round, slightly spalted, and sanded on both sides. 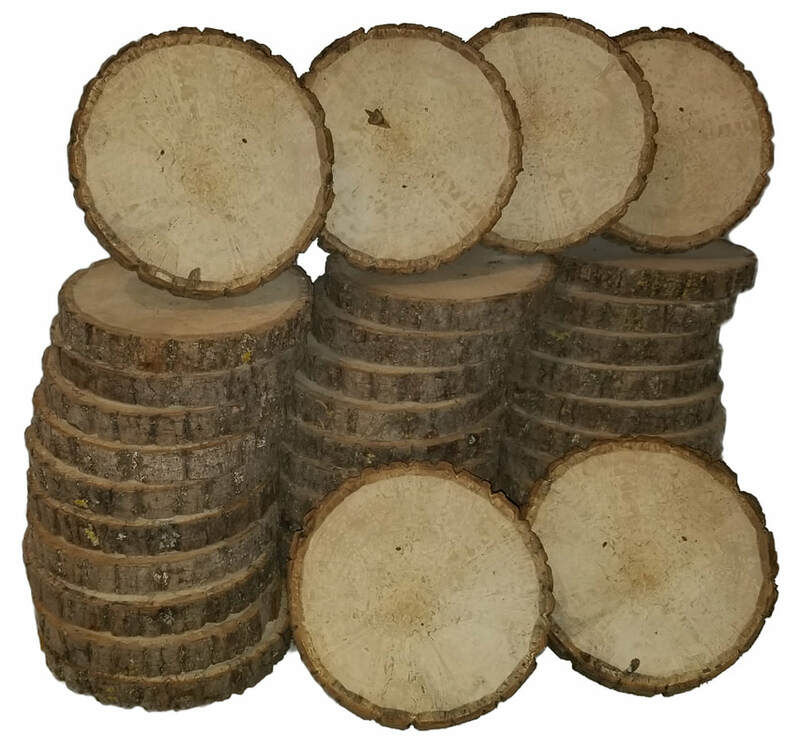 They are 5 - 5.5" in diameter, and 11/16" thick. Bark is intact. Never treated. Sanded on both sides.